Sun in Aquarius’ insistence on expressing his individuality will be encouraged by Moon in Aries’ need for excitement. This dynamic relationship will be full of vitality, independence and self-expression. Aries’ fire will heat up Aquarius’ sometimes cool approach to love, and Aquarius’ stubborn focus will give Aries some structure (although the Aquarian version of structure is not one that most people would recognize). Sun in Aquarius is the fixed rebel. Sure, he’s all about freedom, detachment and liberation. 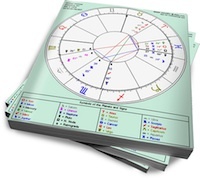 But he is also a Fixed sign, meaning the unique path he walks is not one from which he easily deviates. Therefore, Sun in Aquarius can make an incredibly committed partner, as long as he finds someone who understands that he is never going to merge with his lover. He must have room to do his own thing, and his idea of a committed relationship will probably not be traditional. The slight distance that always shimmers between him and his partner doesn’t mean he doesn’t love. He loves from a couple of steps back, where he can observe and take in the whole picture. The benefits of this include his unwavering friendship, whether or not the romance lasts. But if he’s living out his Shadow, he may abruptly exit the relationship just because he wants something to rebel against. Moon in Aries is the warrior heart. She needs passion and challenge to feel alive (and, ironically, safe). A placid existence will not satisfy this Mars-ruled Moon, so her partner should be able to keep things interesting, or at least stand up for himself when she takes a metaphorical swing at him. Moon in Aries will test her lover, because this is how she expresses her feelings. The good thing is that her moods flare up and burn out quickly, so she doesn’t hold grudges (she doesn’t have the patience for them). Her Shadow side will emerge when she’s bored; escalating jabs at her partner and outbursts of temper over minor issues are signs that she needs stimulation (or a new relationship). Sun in Aquarius’ unique energy and detached manner will suit Aries perfectly. He’ll keep her interest, and won’t get bent out of shape when she tries to start a fight. Moon in Aries’ fiery moods will keep Aquarius amused and aroused. She may demand a response from him, but she won’t be suffocating or needy (major turnoffs for Aquarius). Plus, Aquarius’ consistency and stubbornness will be the stabilizing force in this relationship. These two may spend more time apart than other couples, but they’ll always touch base with each other in a burst of energy that never gets stale. That will be the last one in the series.